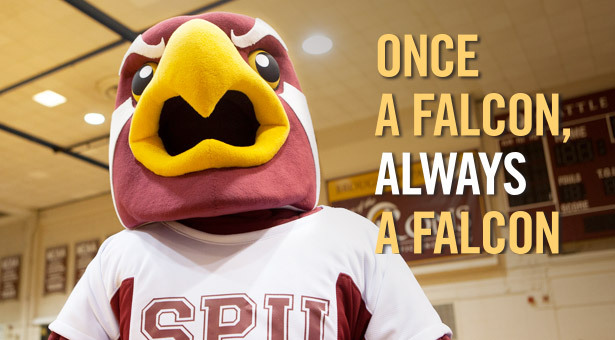 Homecoming 2015 drew hundreds of Seattle Pacific University alumni back to campus for the unique annual celebration. Multiple decades and generations enjoyed a cavalcade of tours, sports competitions, affinity group reunions, and talent showcases, punctuated by long hugs and handshakes between old roommates, teammates, and soul mates. Kari Newbill Lannon ’95, sporting a new doctorate in clinical psychology, made the trip from Virginia Beach, Virginia, for her 20-year class reunion. Shakespeare aficionados packed E.E. Bach Theatre for visceral performances of King Lear, featuring retiring Professor of Theatre George Scranton ’69 in the title role. Falcon fans cheered a basketball doubleheader in Royal Brougham Pavilion. The women’s team prevailed over rival Montana State Billings 64-55, while the men lost to Simon Fraser University 84–83. 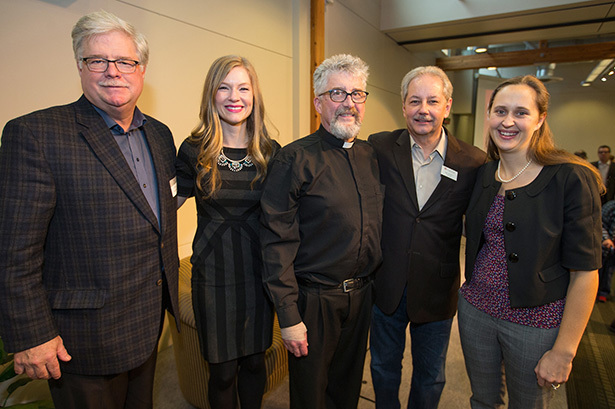 2015 Homecoming Award winners (left to right): Medallion Award winner Gordon Werkema ’80; Young Alumna of the Year Kristen Eddings Tetteh ’06; Alumnus of the Year Rick Reynolds ’75; Kim Gilnett ’74, accepting the Distinguished Service Award given posthumously to Jennifer Johnson Gilnett ’81; and Medallion Award winner Jeanette DeBlois Fiess ’02.